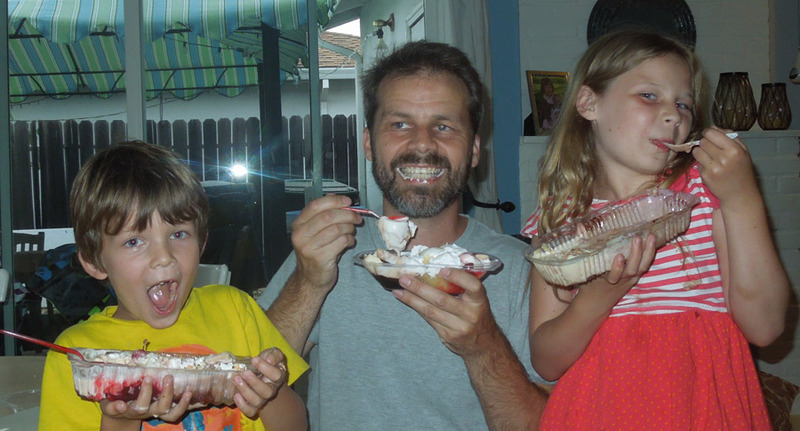 With the thinnest varnish of scientific intent, I got the kids together for an investigation into our three local ice cream parlors. Yes, three local ice cream parlors. We went to Farrell's, Dairy Queen and Leatherby's. 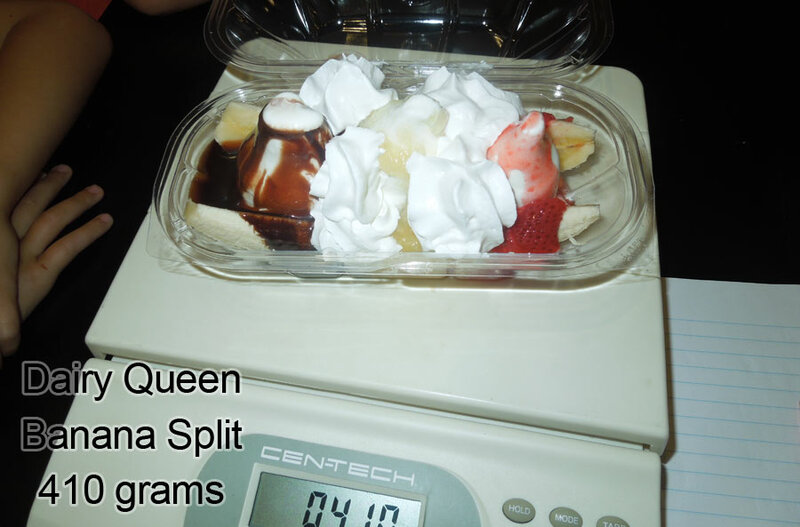 We compared their banana splits. The first stop was Dairy Queen. 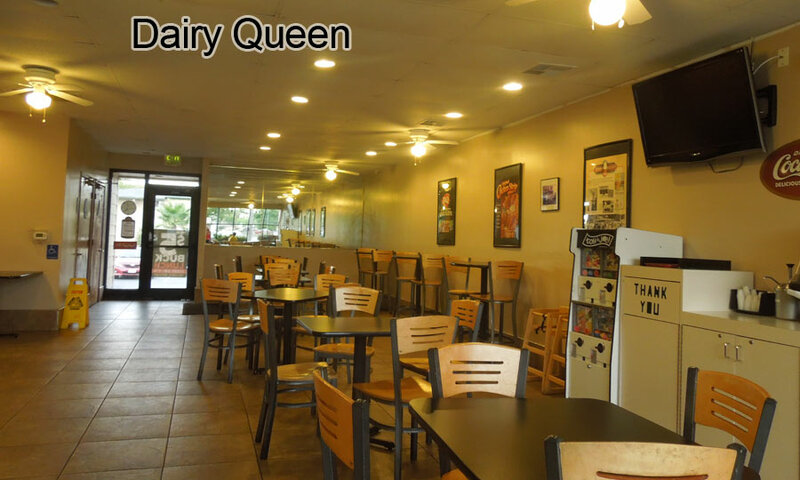 Dairy Queen is a fast food ice cream joint. They don't have tubs of real ice cream sitting in a freezer case. They have soft-serve ice cream mix extruded from a standing freezer apparatus. When we visited, the day was overcast and the Queen's interior was DQserted. I ordered a banana split. When it arrived, it looked delicious. 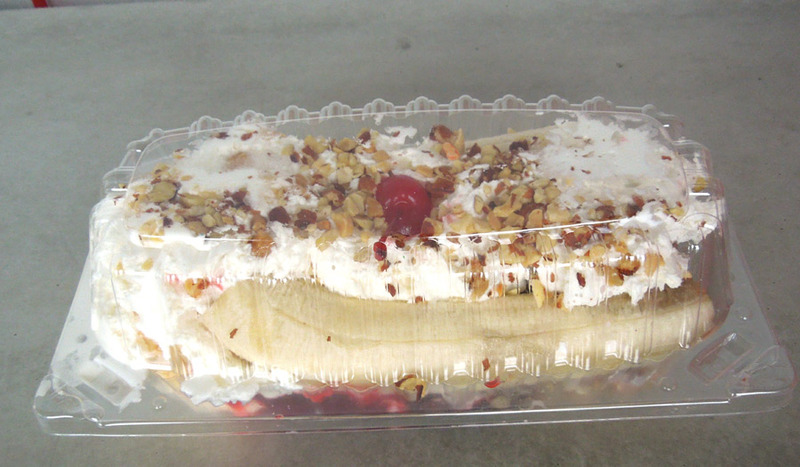 It was $4.99, had the better part of a banana sliced down the middle, sandwiching three peaks of vanilla ice cream. The ice cream had chocolate sauce, pineapple sauce and strawberry sauce, covered with four star columns of whipped cream. It weighed 410 grams, including the container. Only later did I realize the sundae was missing two things. This split had no nuts and no cherry on top. 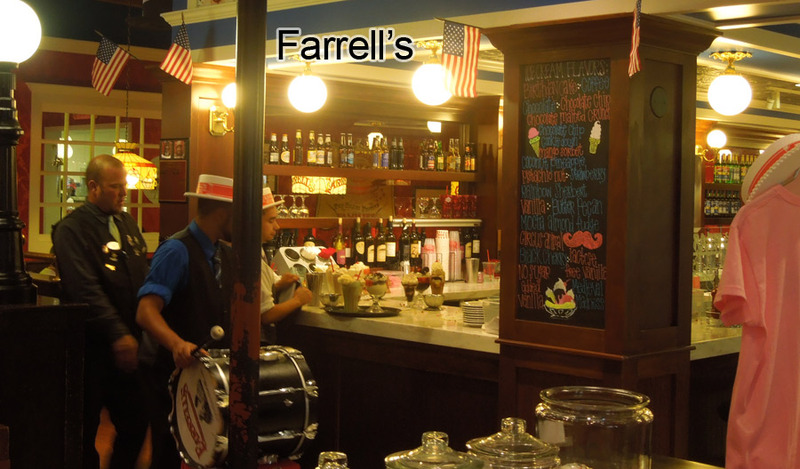 Farrell's ice cream is a newcomer to my neighborhood. It's an olde fashioned parlor, an environment full of striped shirts and flair. I think this decor represents the 1890s. 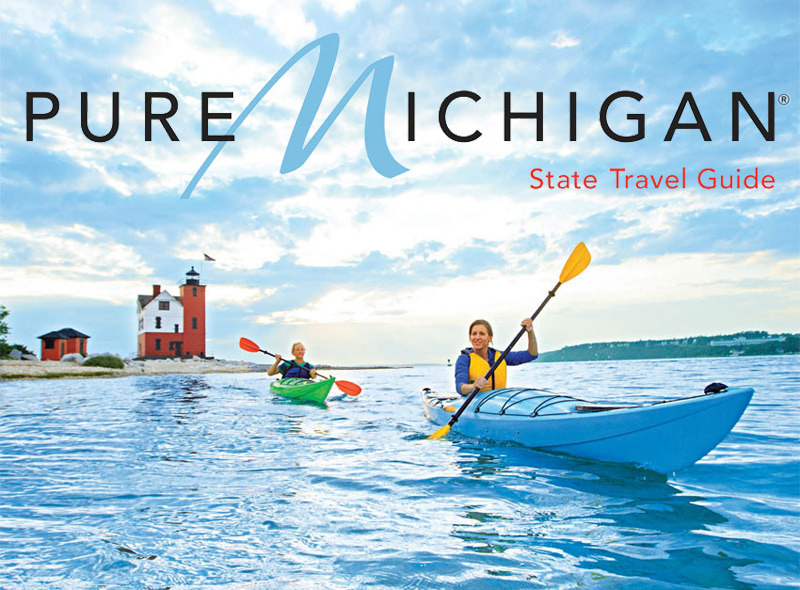 This is the closest you are going to get to Disneyland for less than $90. 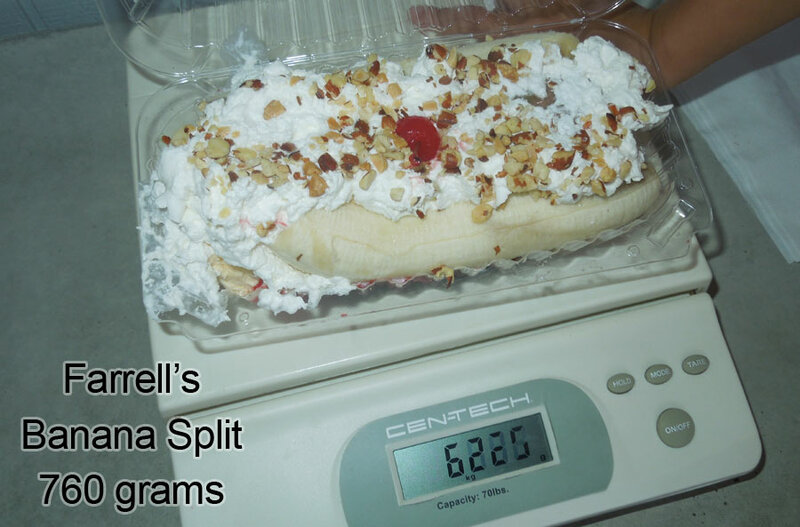 The Farrell's banana split was considerably more extravagant, beginning with the pricetag. It was priced at $9.55. It had three scoops of real ice cream: chocolate, strawberry and vanilla ice cream. Two halves of a banana were poised on either side and it was covered in a real whipped cream, tons of nuts and a cherry on top. I know there was strawberry sauce, and I assume there was pineapple sauce and chocolate sauce too. It weighed 760 grams. I guess when I say "a ton of nuts", I really mean about 10 grams of nuts. This was a delicious, beautiful banana split. There was one defect, a brown bit of banana had been included. It wasn't a problem. 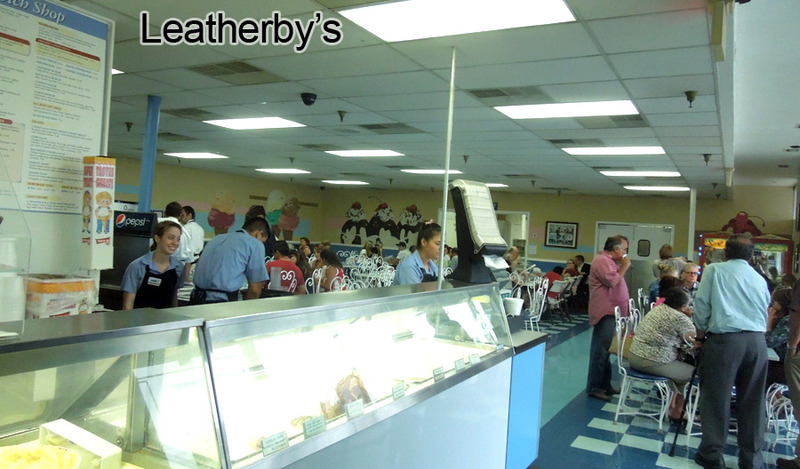 The final banana split came from Leatherby's. Yes, I know that's a better name for a furniture store, but it's a Sacramento landmark. Technically the name is "Leatherby's Family Creamery and hide tanning warehouse". The atmosphere isn't quite as all-consuming as the atmosphere of Farrell's, but they do have a very attractive crew of peppy workers. The counters are similar to a soda fountain from 1950s, although in this photo that acoustic ceiling is shattering the illusion. On the day we visited, it had a gay, festive atmosphere. The banana split looked awesome. It was $10.29 and 825 grams. This was the largest plastic clamshell yet. Three huge ice cream scoops dwarfed the bisected banana. The whipped cream was localized to the middle scoop of cream (chocolate), which allowed easy identification of the pineapple, strawberry and chocolate sauce. There were grams of nuts and a HALF-cherry on top? How expensive are these cherries? Wow. I guess four different fruits is an exotic combination for an ice cream treat. I can handle there being only a hemisphere of cherry. Despite careful planning, it was not reasonable to expect a side-by-side photographic comparison of all three banana splits. 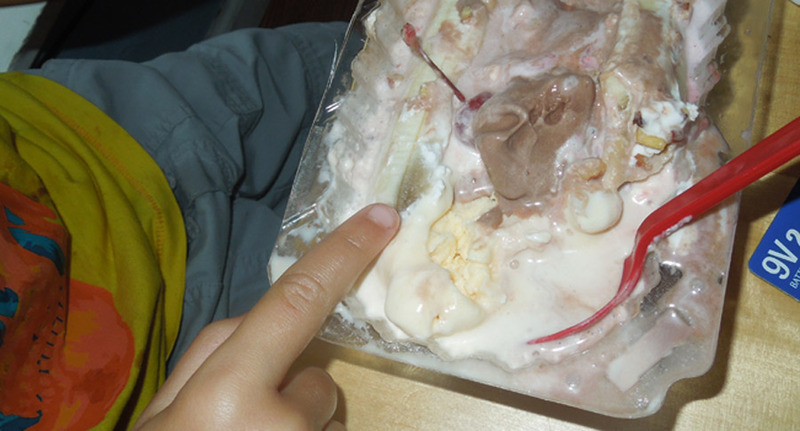 I hope this half-eaten version can express the whole truth of Sacramento banana splits. 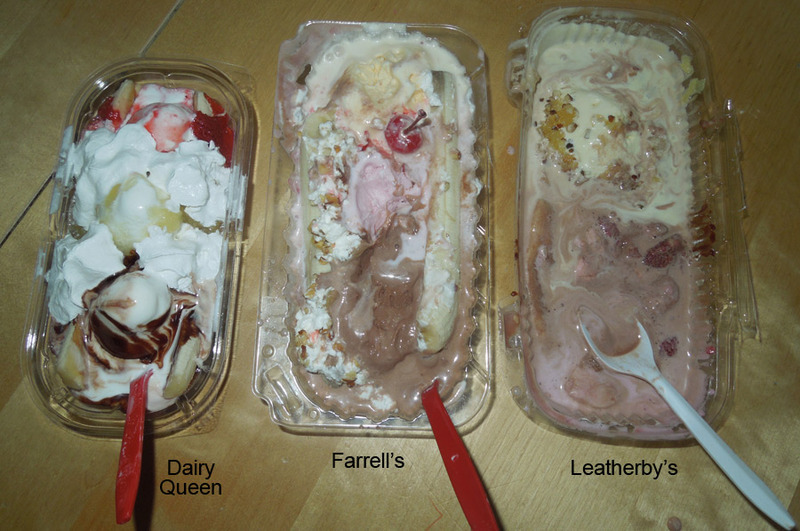 Dairy Queen is small, Farrell's is bigger and Leatherby's is the biggest. 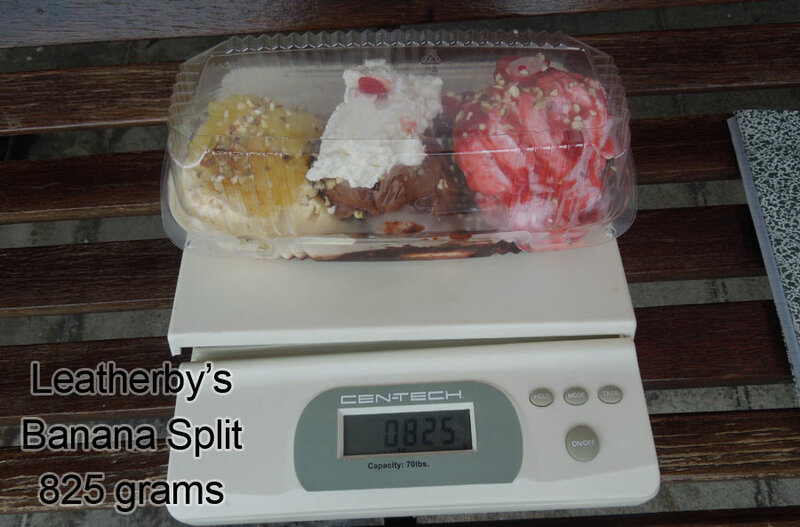 All three banana splits were within a few cents of being the same price per pound. DQ was $5.54 per pound, Leatherby's was $5.66 and Farrells was $5.70 per pound. Nearly identical! Based on this equality of banana sundae candidates, our judges had this in a split decision.